Cloud computing is big business. Public cloud spending is expected to grow 18% year over year to an estimated $260 billion in 2017, according to market research company Gartner . That growth is expected to skyrocket to $411 billion by 2020. The market size of this opportunity is attracting the biggest names in technology. Investors looking to profit from this growing trend should consider Amazon.com (NASDAQ: AMZN) , Microsoft Corporation (NASDAQ: MSFT) , and Alphabet Inc. (NASDAQ: GOOGL) (NASDAQ: GOOG) , the clear leaders in the cloud computing revolution. Investment in cloud computing is skyrocketing. Image source: Getty Images. Data provided by Gartner . and Synergy Research Grou Chart by Author. IaaS = Infrastructure-as-a-Service. YOY = year over year. Cloud computing in its simplest terms is the storing and accessing of computer programs and data over the internet. These services are typically used as needed or on demand. The “cloud” referred to in cloud computing is the internet, so called because, in the early days online, some diagrams used the image of clouds to depict a concept that was not as widely understood as it is today. In some instances, a business may need additional computing resources, and making a large capital investment for additional servers or software might not be practical. This is especially true when trying to meet peak or seasonal demand. Cloud computing can provide a cost-effective solution. There are several types of services that are covered under the broad heading of cloud computing. Infrastructure-as-a-service (IaaS) allows companies to rent time and space on servers on a pay-as-you-go basis, and the segment is expected to post the most substantial growth over the next five years. Software-as-a-service (SaaS) is — as the name implies — the use or delivery of software applications via the internet. These normally require a subscription and the provider will typically handle any regular maintenance updates and security patches. Microsoft Office 365 is a great example of this. Platform-as-a-service (PaaS) provides the platform, environment, and tools necessary to for the development, running, and testing of apps and software. A software developer kit like Google’s App Engine is a good illustration. Cloud computing can also be used for file storage, backup and recovery, and data analytics. Almost anything that can be accomplished locally can be done in the cloud. Gartner’s Magic Quadrant for Cloud Infrastructure as a Service, Worldwide. Image source Gartner. Used by permission. When it comes to cloud computing, Amazon is the 800-pound gorilla in the room. The company debuted Amazon Web Services (AWS) in 2006 as a way of renting unused space on its massive server farms, and in doing so, pioneered the IaaS market. 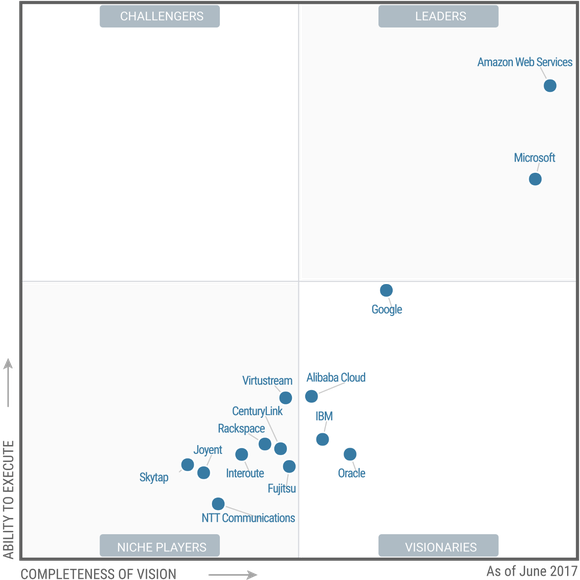 According to Gartner’s Magic Quadrant Amazon is the undisputed frontrunner in IaaS and has been for the last decade. It controls an estimated 40% of the market and a significant lead over its next nearest competitor. The company also leads in the integrated IaaS+PaaS market. AWS offers a wide variety of pay-as-you-go services including database storage, application services, analytics, and artificial intelligence. In the third quarter 2017, AWS saw net sales grow 55% year over year, producing 10% of Amazon’s revenue and all of its profit. In fact, AWS is currently subsidizing the company’s e-commerce business, which is operating at a loss. The reason the cloud computing segment contributed so much is because of its really massive operating margins. Of the $4.6 billion in revenue generated by AWS, it produced operating income of $1.17 billion — operating margins of over 25%. The customer list for AWS is a veritable Who’s Who of well-known companies, including Netflix, Inc. , Ancestry.com, Expedia, Inc. , Live Nation Entertainment , and Hulu. Cloud Infrastructure Services Q3 2017. Image source: Synergy Research Group. Microsoft is a significant player in more than one segment of cloud computing. The company is the leader in the SaaS market according to Synergy Research Group . 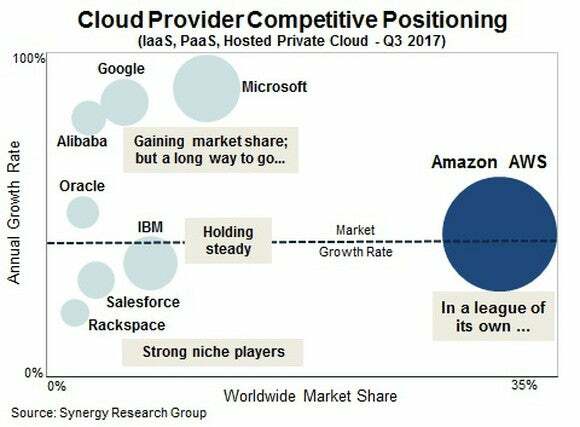 Microsoft is also a key player in the IaaS market, with its Azure cloud platform second to only AWS, with an estimated 11% market share. The company is also the only other company in the “leader” quadrant, according to Gartner, which estimated Azure’s end-of-2016 revenue run rate at approximately $3 billion. Azure has been seeing robust adoption, particularly among those with a penchant for Microsoft products and working environment. While Azure’s offerings are still dwarfed by AWS, the company continues to beef up Azure to include additional services and its expertise to help customers with deployment. In the most recent quarter, Microsoft’s Office commercial products grew 10%, largely the result of commercial revenue from Office 365, which jumped 42% year over year. The company’s intelligent cloud segment grew 17% year over year, with revenue from its Azure Cloud increasing 90% over the prior-year quarter. Google is known for its ubiquitous search, but because of the data centers and server farms needed to facilitate that business, the company has effectively been a cloud company since day one. Google places a distant third in the cloud computing arena, garnering an estimated 6% of the market. It should be noted that while the company has had a platform offering since 2008, it didn’t enter the IaaS market until 2013. Google Cloud has made remarkable headway in a relatively short time, and the company has been aggressively playing catch-up. Urs Hölzle, Google’s senior vice president of technical infrastructure, has stated that he believes that within several years, the company’s cloud computing will generate as much revenue as its advertising business. Two years ago, the company hired Diane Greene, co-founder of VMWare to run its cloud business. Ms. Green believes that Google Cloud could take on AWS for the top spot as early as 2022. For the three months ended September 30, 2017, Google’s “other revenues”, which includes cloud computing and the Google Play app store, grew 40% year over year to $3.4 billion and amounted to 12% of Google’s revenue, up from 11% in the prior year period. Cloud computing is still a relatively young concept, having been pioneered by Amazon in 2006. 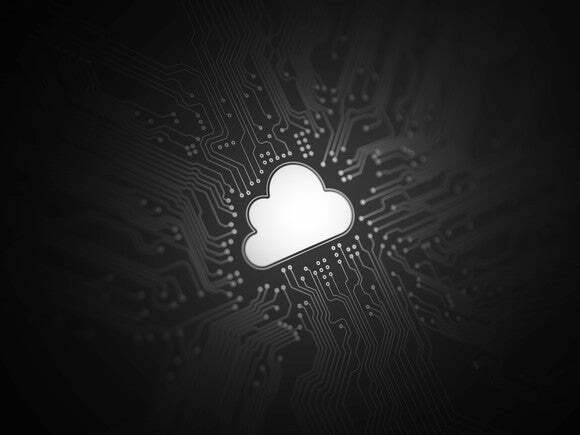 Cisco ‘s Global Cloud Index report estimates that annual global cloud traffic will grow at a compound annual growth rate of 30% between 2015 and 2020 and more than quadrupled during that time. The report also forecasts that over the same five years, public cloud workloads will grow from 49% of the total to 68%. The early movers in this field will continue to reap the benefits for years and possibly decades to come. David and Tom just revealed what they believe are the 10 best stocks for investors to buy right now… and Amazon wasn’t one of them! That’s right — they think these 10 stocks are even better buys. John Mackey, CEO of Whole Foods Market, an Amazon subsidiary, is a member of The Motley Fool’s board of directors. Suzanne Frey, an executive at Alphabet, is a member of The Motley Fool’s board of directors. Teresa Kersten is an employee of LinkedIn and is a member of The Motley Fool’s board of directors. LinkedIn is owned by Microsoft. Danny Vena owns shares of Alphabet (A shares), Amazon, and Netflix. The Motley Fool owns shares of and recommends Alphabet (A shares), Alphabet (C shares), Amazon, and Netflix. The Motley Fool recommends Cisco Systems, Expedia, and Live Nation Entertainment. The Motley Fool has a disclosure policy . Will My Credit Score Go Up If I Pay Off My Balance? Why 2017 Was a Year to Forget for Chipotle Mexican Grill, Inc.